The Wild Tripelle series is Melbourne based brewery La Sirène's first foray into 100 percent spontaneously fermented beer. For the first release last year, the brewers left their hopped, sweet wort open to the elements in their brewery for months, allowing the native bacteria and yeasts in the air to spark fermentation and add character, before ageing the beer until it was at a point where they felt it was ready for release. For a beer tagged "wild" it wasn't actually that wild, instead an intensely citrusy, malty beer: full-bodied, dense and well integrated. It wasn't exactly what head brewer Costa had expected but, then again, given it was an experimental brew he had no clear idea of what would transpire, only that they would give it enough time to be good before release. So, second time around, he decided to make a change: the base ingredients were the same, but this time it was poured into an open fermenter in January to allow it to ferment through the hotter months. And what a difference the different temperature has made. The beer still possesses distinct citrus characters, but there are also shades of acetic acid (one of the defining, balsamic like, characteristics of Rodenbach's beers) and lactobacillus there, adding an acidity and gentle sourness to balance the weight of the 8 percent ABV body. 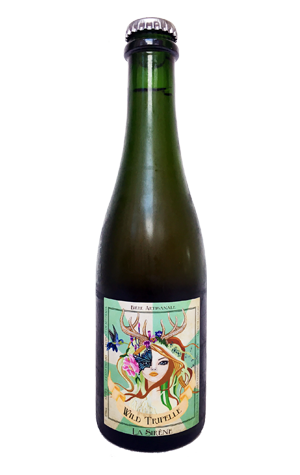 There's hints of wood and also the vinous qualities of a Chardonnay – this without the beer spending any time on oak. If you're into complex farmhouse style ales, then check this out. There's a lot going on – and the brewers reckon the beer will continue to develop in bottle for another year and more (and they recommend storing at 15 to 18C to allow this to happen) – but the elements pull together well and we reckon it could be one of La Sirène's best yet.